Alyse Vail, program director of the Hancock County Community Foundation presents Donna Griffin, director of Dani’s Dreams Outdoor Education with the check that will start construction of a Go Green Discovery Center focusing on alternative energy and conservation education. Dani Griffin Innovation in Education Committee Members and Zion Lutheran Church and School officials were on hand for the presenation. Pictured are: (from left) Zion Lutheran School Principal Kristie Sombke, David R. Griffin, Dave Griffin, Courtney Sloan, Debi Adam, Darcy Finchum, Alyse Vail, Katie Morris, Don Adam, Dawn Morris, Donna Griffin, Pat Adam, Donnie Adam, Kelsey Pope, Pastor Jason Taylor, Diana Pope, Debbie Dirr. 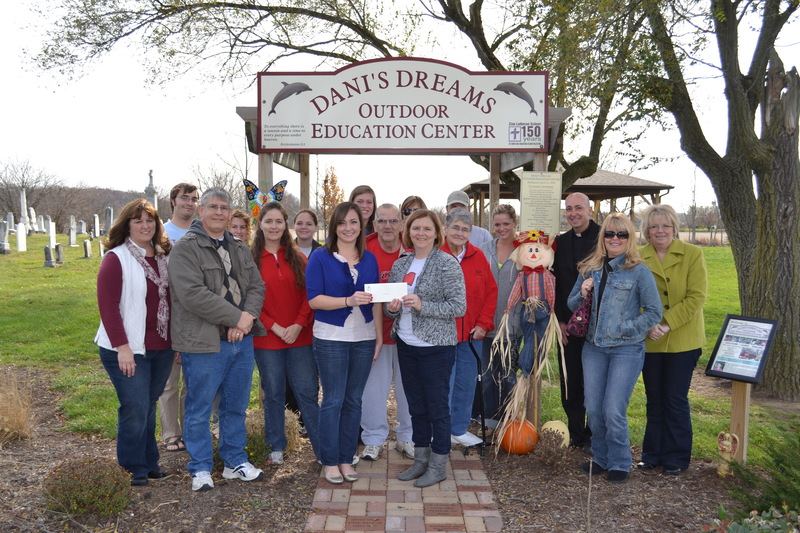 Dani’s Dreams of a Go Green Discovery Center for environmental education in Hancock County will take root with a $4,500 grant from the Hancock County Community Foundation awarded Nov. 12 at Dani’s Dreams Outdoor Education Center at Zion Lutheran School in New Palestine. The grant will start construction of the Go Green Center that will focus on environmental education for grades preschool through 8 in Hancock County – with a community garden, interactive exhibits and experiments in solar and wind energy. The building will also be powered by alternative energy sources. The mission of the Go Green Discovery Center will be to empower students and involve them in both teaching and learning to develop knowledge of and responsibility for the world surrounding them. Teachers, students, Scouts and community groups are encouraged to become a part of the center’s planning and operation. Architectural/CAD students throughout Hancock County can submit designs for the facility to be constructed this spring. The winning design will have credit in the dedication plaque. Teachers can also sign up to be eligible for a $200 Go Green Grant. More information on both contests can be obtained on Dani’s Dreams website, http://www.danisdreamsoutdooredcenter.wordpress.com or by emailing dgriffins@netzero.com. You can also take a break from leftovers and turkey after Thanksgiving and have dinner at McDonald’s on U.S. 52 in New Palestine Nov. 28, 5-8 p.m. Dani’s Dreams committee members will be at the restaurant that night with free tree cookie nametags for children and information on the outdoor education center’s programs. Teachers and youth group leaders will be able to sign up for the Go Green Grant contest. Community support will be needed for the center’s continued development. Dani’s Dreams is the only outdoor education center in Hancock County – if you would like to be involved through financial support or volunteering, email dgriffins@netzero.com or call 317-640-4430. Previous PostReady…Set…Go! Children’s Museum Gets Families Active TogetherNext PostHancock County Students and Teachers: Think Outside the Classroom!